A young boy called us at the Center asking for our help in finding a cure for his desperately ill rabbit, Mike. 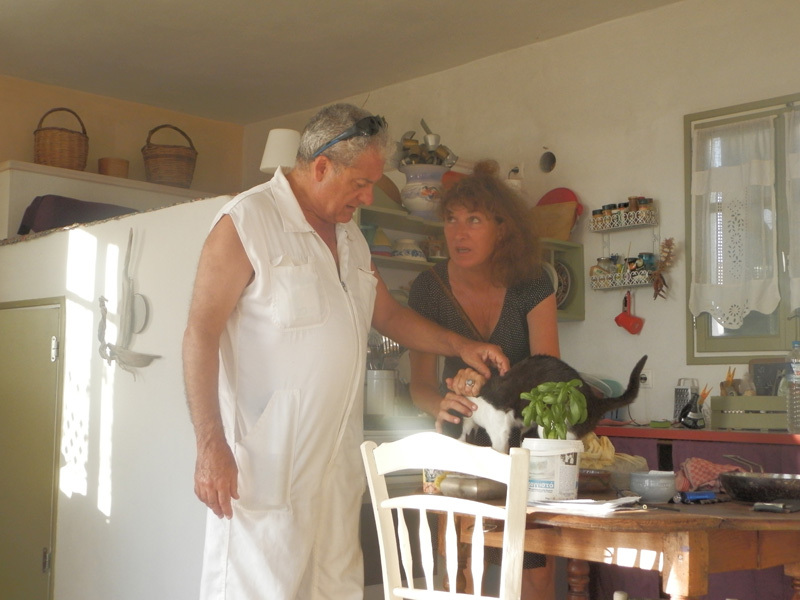 Once the rabbit arrived we immediately called our veterinarian Dr. Dimitris Vasalakis. The diagnosis was a skin disease known as psoriasis that had left Mike so weak he could no longer stand or eat. 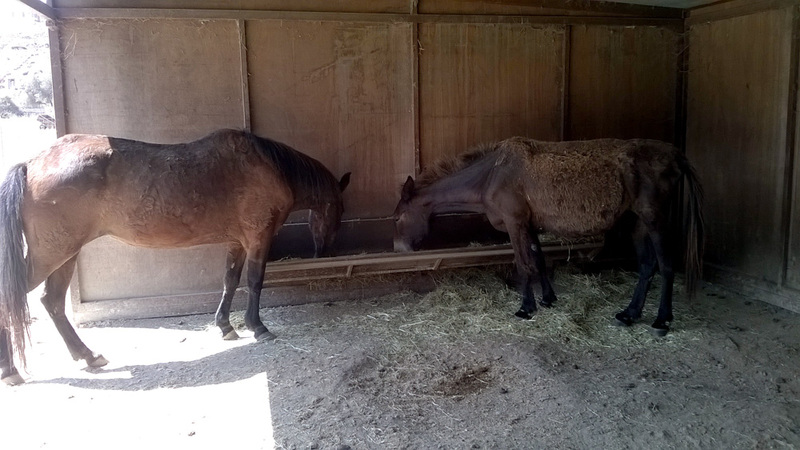 We were told to begin injecting antibiotics and feeding nourishment and vitamins by syringe. By morning, after a night spent sleeping quietly on a heating pad, Mike was able to stand, to nibble on carrots and to drink water by himself. It took so little to reclaim the health and life of this small creature—the intensive care that we were able to provide gave the rabbit the strength he needed to begin to heal and he will stay here with us until he is strong enough to return to his home. At that time we will teach the boy how to recognize any symptoms that might possibly reoccur and to care for the rabbit himself. We have great hopes that Mike will live a long and active life and we are grateful to the boy who cared enough to bring him to us at the Center. If you want to help Mike and others like him, please consider making a donation. Without your help we would not be able to care for animals in an emergency such as this. Thank you! 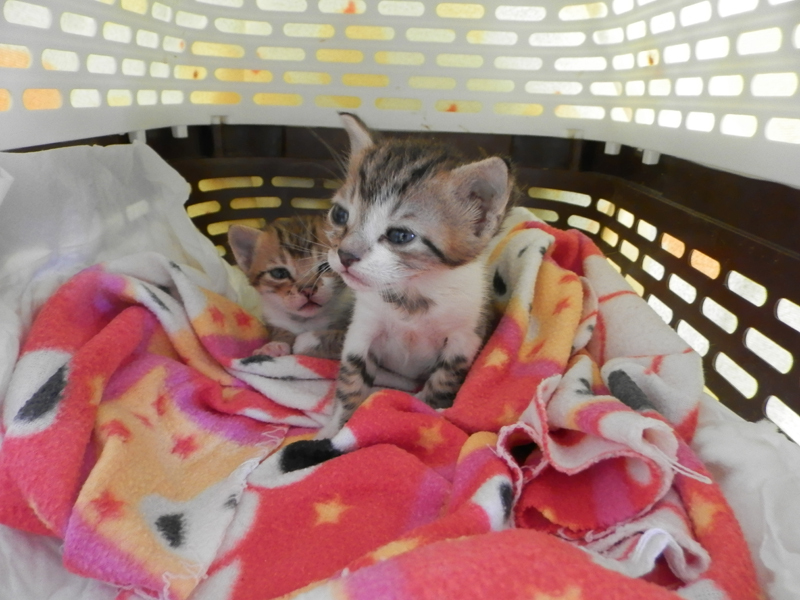 Our sterilization program in Amorgos has been completed with great success. 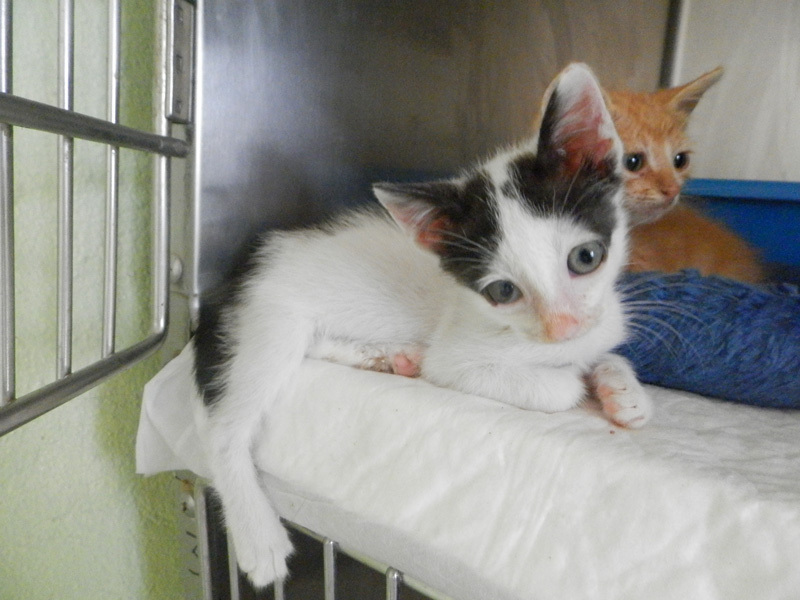 Ninety four cats, sixty three females and thirty one males underwent the procedure in a period of four days. All the cats are in good health and they have been released back into their preferred territories. Dr. Manolis Vorisis and Dr. Andrianna Papadimitropoulou worked with the help of our volunteer, Hariklia Psaki, for thirteen hours each day in order to carry out this project and, at the same time, some of our local population brought in their dogs for examination and vaccination. We want to thank the Municipality of Amorgos for their great cooperation and also the Minoa Hotel (http://www.hotelminoa.gr), the Aegialis Hotel & Spa (http://amorgos-aegialis.com/) and the Pension Angeliki (http://www.angeliki-amorgos.com/gr/) for their kind hospitality to our veterinarians. We also want to thank Mike Vekri, owner of the restaurant Asteria, for his grant of tables and chairs. And most especially, we want to thank our veterinarians Dr. Manolis Vorisis and Dr. Andrianna Papadimitropoulou who traveled from Athens and Syros to volunteer their services, the writer and editor from Dutch TV, Jaap Poot, for filming this entire process, our volunteers who worked non-stop from morning to night, and, as well, we want to thank the residents of our island who helped to make this happen. Dr. Vorisis with his helper Hariklia Psaki. Dr. Andrianna Papadimitropoulou just finishing the sterilization of one of the kittens of our Center. Dr. Manolis Vorisis during the work. Dr. Manolis Vorisis examines the dogs of Stamatis Simos who brought them for their annual vaccination. Do you have free time? Do you love animals but aren't able to have your own pet? Come to our center and spend a little time with ours—we welcome your help and the animals will love you for it! Consider devoting a few hours of your day helping these animals in need. We are looking for volunteers to help us take care of the many cats, dogs and equines in our care. For more information contact us at luco1982@hotmail.com or 6974990045. Little Voulitsa was living with her mother, Voula, and her three siblings, in an area where there had been serious outbreaks of disease and infection. Only Voulitsa and her mother were found alive when we reached them and, as you can see in the photographs that we have included below, they were both very close to death. After an intense period of care and treatment in our facility both the mother and daughter have not only survived but have each recovered their health and strength. Voula has now been released back into her home area after having been spayed but we felt that we could not allow Voulitsa to return with her mother since the area is extremely dangerous for young kittens. Chickens and ducks and cats are all kept together in a small yard by a woman who has consistently refused our help with sterilizations and medications, which means that Voulitsa has remained with us at our center. Voulitsa has put on weight and has now become an active and very playful kitten but we must continue treatment in the hope of saving one of her eyes. Soon she will need a foster home while waiting for the family that we hope will come to adopt this small girl and give her a safe and loving home—the miracle that we want for all of these animals who are brought to us in their great need. Voula as she was released. One early morning in June of this year, a woman who works in a café in the central square of Katapola called our center to tell us that the café cat, who only the night before had been healthy and full of life, was now desperately ill.
Litsa, our coordinator, went to the café at once and saw that the cat was not only covered with a caustic liquid of some kind but that in trying to clean himself he had swallowed much of the toxins and his life was clearly in danger. At the center we began to clean him and, when the room filled with the smell of lime, we realized that he must have somehow have fallen into a vat of that very corrosive liquid. 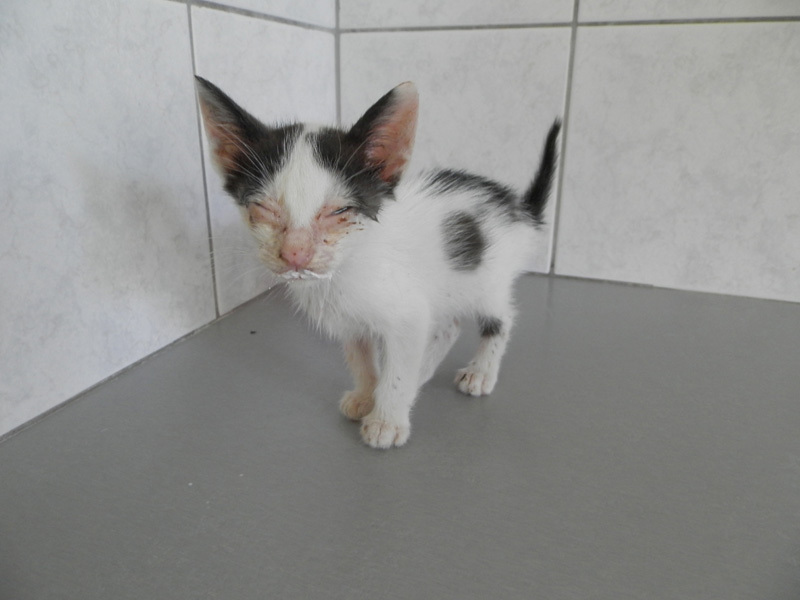 We immediately treated him with a course of antibiotics, cortisone, painkillers and creams but he was unable to eat and had developed a high fever. The wounds were severe and we had little hope for his survival but day by day he began to improve and so we gave him the name of Angel. It took a month of treatment but Angel has now returned to being the handsome boy that he was before the accident. A few of the wounds remain but new hair has begun to grow and his appetite has returned. Once Angel’s wounds have healed completely and his fur has grown thick, he will be driven to the central square of Katapola where the sweet lady who has fed him since he was a kitten is waiting for his return. During a recent visit to Amorgos by GAWF's Animal Action’s team, we were told of an old mule living in Vroutsi, who, because of his age and his ill health and injuries, was no longer useful to his owner. We decided to take Marcos to our shelter in Katapola where he could be examined by Animal Action’s veterinarian, a doctor who specializes in equines, and it was found that the mule had many physical problems which included a hip fracture as well as malnourishment. 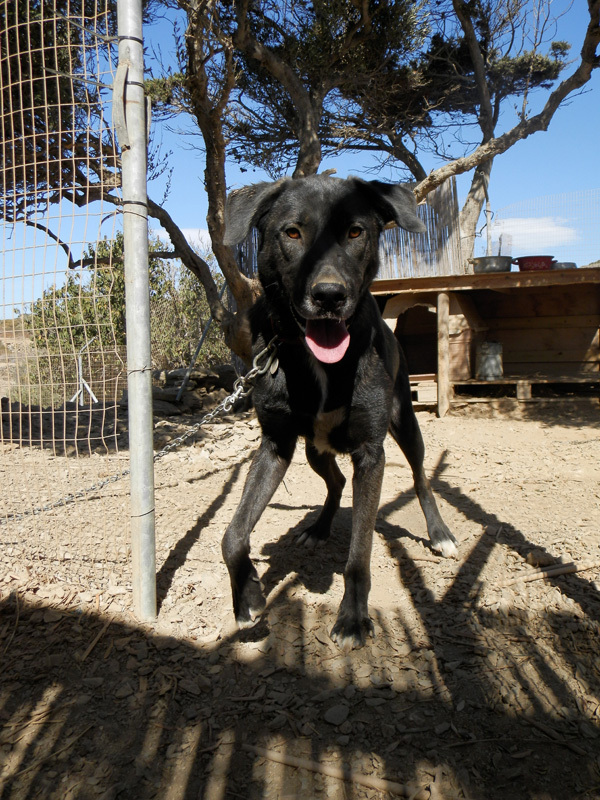 But after dedicated care by our team and a good diet, Marcos is no longer in pain and he has begun to put on weight. Until recently we have kept Marcos in a fenced in area so that he could rest and recover his strength but now he has joined the rest of our equines. This is another one of the small miracles of Animal Zone International since, Paola, the matriarch of our equine herd and a mare who does not easily accept new members, seems to have understood that Marcos is very weak and unable to kick and she grows ever more gentle with the old mule. We, at AZI, are happy to say that we expect Marcos to live out his old age in a state of peace and well being.